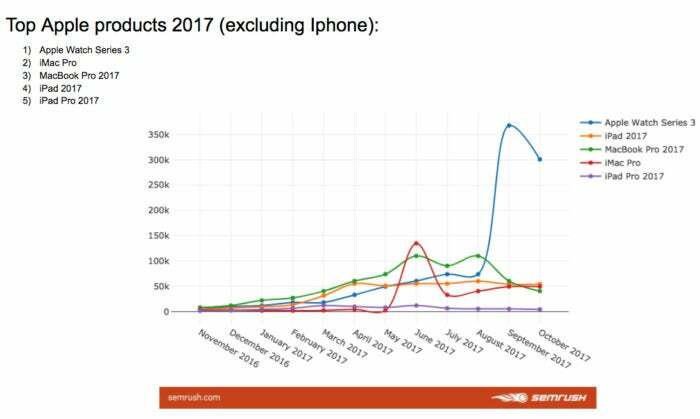 Research from SEMRush shows just how much people are interested in iPhone compared with other Apple products, plus which Apple product is likely to take off. On launch, Apple sold around 3 million iPhone X units in just 20 minutes. That works out to be around 150,000 phones per minute and 2,500 iPhone X sales per second. That’s by far the biggest product Apple — or anyone — has to sell right now. 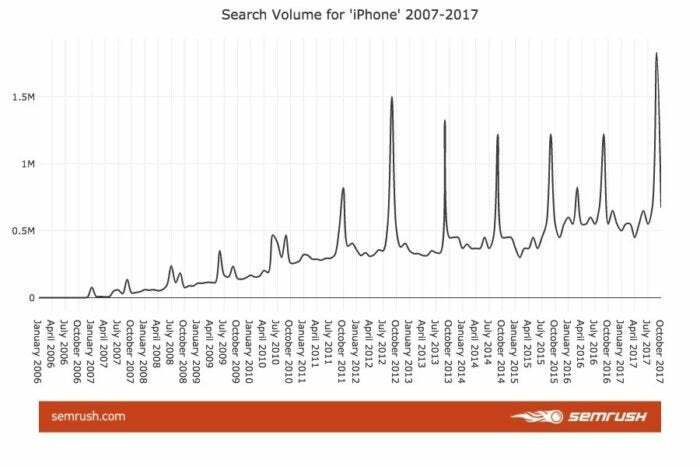 This graph gauges the interest in several Apple products on the basis of search engine activity monitored (images supplied by) SEMRush. As you can see, interest in the Apple Watch Series 3 grew across the year. At time of writing, it remains the most interesting non-iPhone Apple product, followed by iPad, iMac Pro, MacBook Pro 2017 and iPad Pro. Now look at this chart, which does an excellent job of showing how interest in iPhone truly eclipses public interest in Apple’s other products. Interest in the iPhone 8 has been building up all year, while iPhone X activity only really ramps up around August 2017. That’s not a blip, nor does it reflect any lack of interest in the high-end new smartphone. What it does reflect is that most people hadn’t yet begun referring to iPhone X as iPhone X — we all saw it as iPhone 8 until we got closer to its announcement and the name was leaked. What is interesting about the graph is it shows that interest in both models peaked into September. I think this reflects that Apple watchers were very interested in both models; however, since their introduction, interest around iPhone 8 has waned rapidly while iPhone X has now emerged as Apple’s most interesting product. 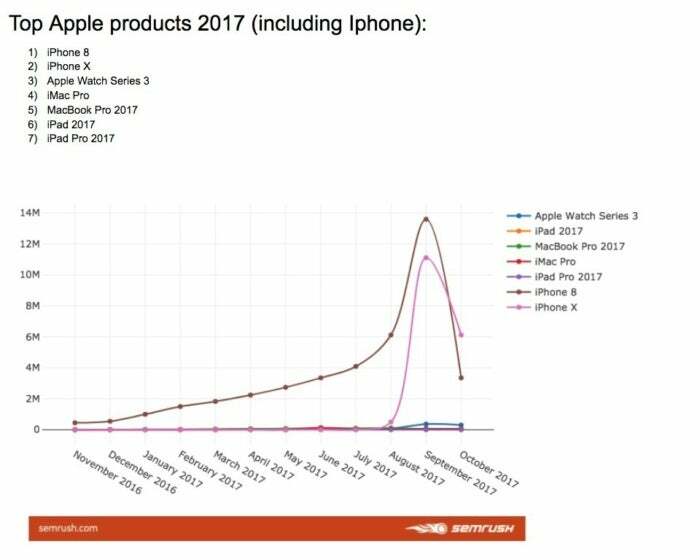 The chart shows lots of uplift for the new Apple Watch, which we know has been a good success for the company, but all the other products don’t seem to register. That’s not because interest isn’t there — it is, and we know that it is from looking at the previous chart, but it quite clearly shows that the planetary internet population is focused on iPhone. (That’s also true in comparison to the new Pixel, as the graph at the end of this story shows). I make no bones about declaring Apple Watch a hit Apple product. I do so because I really think it is, and I think we’re on the edge of seeing it hit the mainstream. Eventually I believe Apple Watch (and AirPods and those Apple VR glasses we all know the company will soon introduce) will become one of the products you can get from what is going to become the world’s biggest wearable computing designers. Do you really think all those fashion people Apple hired a year or two back spend all their time looking at watch straps? So, does the data bear such a vision out? I think it does. The above chart shows how interest in the Apple Watch has waxed and waned since before the product was launched. I see it this way: I was writing about Apple Watch for a long time before it was introduced. That article was written in January 2014, right at the start of the timeline in the above chart. At the time, the people who wanted to know about the device could very much be defined as hardened Apple watchers, industry people and others who may have a reason to be interested in the product. That’s a niche, not a mass market audience. The chart shows that niche audience suddenly became a much bigger mass market audience, scaling up once again on the product’s release, subsequent upgrade and every Christmas season since then. Now look at what has happened in recent months. Not only has people's the basic interest people in the Apple Watch stabilized, but it grew with the introduction of the Series 3. 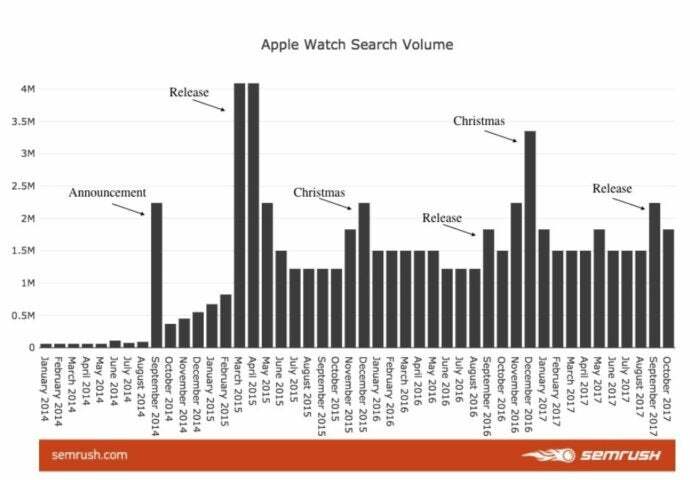 Look closely, and you’ll see interest around that new model was close to the huge response Apple saw when it first announced the device, and it is greater than the interest generated by the last model, which generated its own huge spike in interest last Christmas. Stop and think about how the Apple Watch is still the only clearly visible product in the second chart in this story, and the direction of travel seems clear. Apple’s other hit product is indeed the Apple Watch. It’s not like you haven’t seen this kind of pattern in the past. This final image shows you how interest in the iPhone has grown since the product’s launch in 2017. If Apple maintains this interest and manages to translate that interest into sales, how long do you think it will be until the company sells 2,500 Apple Watch devices every second? Let me know using one of the social media tags below.